You're at your local gym, getting your pump on and lifting dumbbells. You're feeling strong and decide to try a 30 lb curl. 1 rep, 2 rep, 3 rep....Ugh... why is it getting so hard to lift? In this muscle fatigue lab we will introduce you to some more in depth muscle physiology and why your muscles get tired. You will use the Muscle SpikerBox to record your bicep or forearm muscles while doing isometric muscle contractions until fatigue/failure occurs. You will measure the EMG amplitude during the contractions to learn about changes in muscle cells and neural signals during fatigue. Muscle SpikerBox - You should read the "Introduction to EMG's" experiment for you to understand what motor units are. Oxygen and Spiking - You should also read our experiment on Oxygen and Neuronal Spiking to learn some basic metabolism and biochemistry. Our muscle system is the largest system in our body (40%-50% of our weight). This system includes your heart, which is a pump made of specialized cardiac muscle, and the smooth muscles in your guts, allowing food to move. But to make voluntary actions such as lifting a soldering iron or kicking a soccer ball, you use your skeletal muscles! Your skeletal muscles allow you to do all the wonderful movements with which you pass your days. Your muscles contract and enable movement by sliding microscopic actin and myosin protein filaments across each other, with a full support cast of other players including proteins (troponin and tropomyosin), ions (Na+, K+, Ca2+), energy carriers (ATP), and blood circulation to deliver O2 and remove CO2. Each of your muscles is subdivided into functional groups of muscle fibers called motor units (Again, see our Introduction to EMG's experiment). 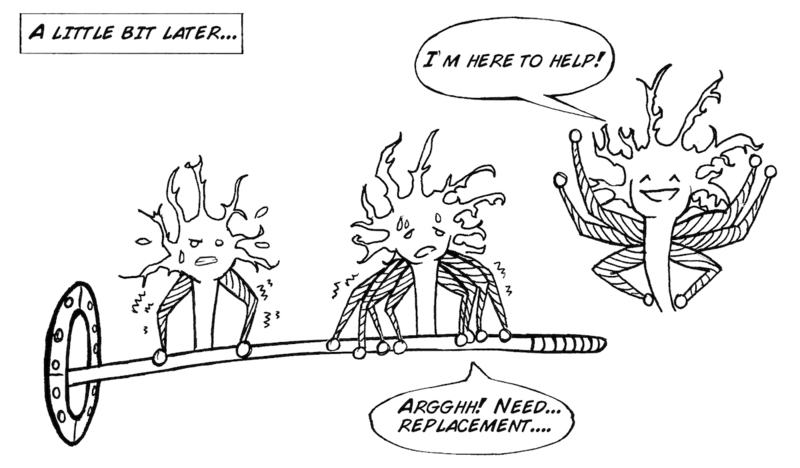 A motor unit is a motor neuron and all of the muscle fibers it innervates. To achieve great things, like lifting a heavy weight, motor units join together in a systematic way to supply the force required to achieve strength. 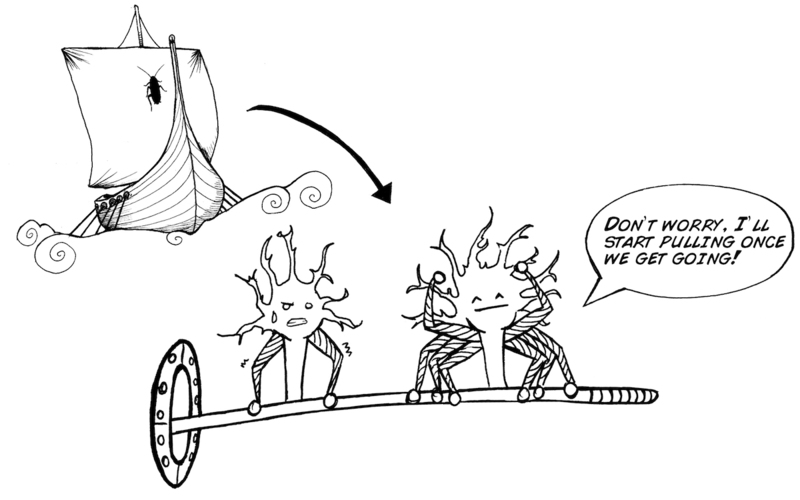 This teamwork among motor units is called "Orderly Recruitment" by scientists, and as stated before, motor units with the smallest number of muscle fibers begin contracting first during a movement, followed by the motor units with the largest number of fibers afterward, to allow for a smooth, strong muscle contraction. In addition, a motor unit can be recruited to replace an already active motor unit that is experiencing fatigue. 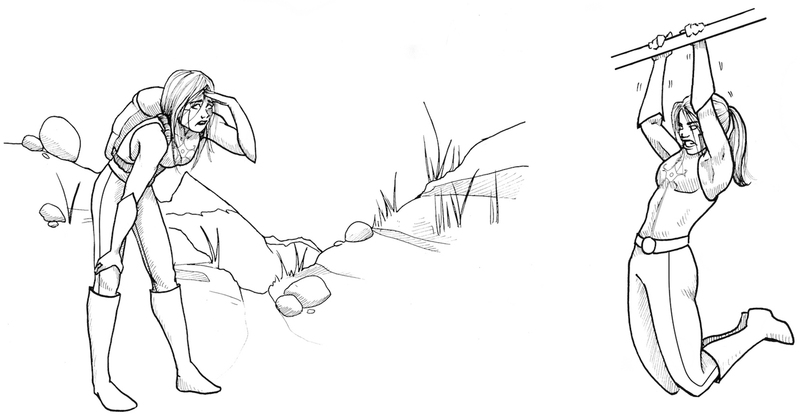 So...how does this all relate to your muscles getting tired? When a muscle cell fires an action potential due to a motor neuron command, this causes a release of calcium (Ca2+) inside the muscle fiber from the sarcoplasmic reticulum. The Ca2+ then flows into the area where the actin and myosin is (the sarcomere), initiating a complex cellular reaction with ATP that allows the myosin to pull on the actin. The movement of myosin pulling on actin in the sarcomeres is called a "sliding filament model" and consists of 4 steps. 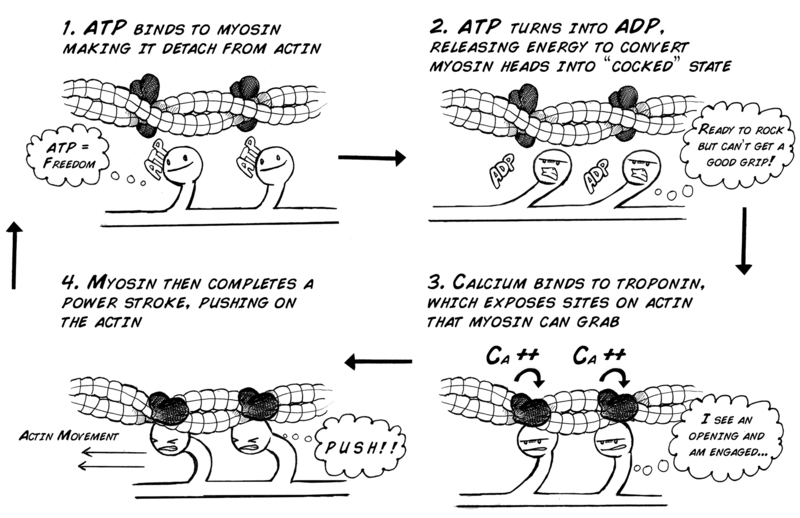 As long as calcium and ATP are available, the actin and myosin will continue pulling on each other and the twitching will continue. Note that the calcium is rapidly transported back into the sarcoplasmic reticulum where the process must be initiated again by the muscle firing an action potential to cause another twitch. The summing together of many of these incredibly tiny "pulling events" produces a twitch (a very tiny, very fast force). When many twitches occur in a row, the twitches sum together and produce a larger force. ATP is continually provided in the muscle by breaking down glucose (see our "Oxygen Experiment" for an explanation of this metabolism. If glucose isn't available, fatty acids can be used to make pyruvate and keep the Krebs cycle and the oxidative phosphorylation pathway operating. As long as oxygen (O2) is present and can be readily transported to the muscle cell, the oxidative phosphorylation pathway can produce ATP at incredible rates. This is called aerobic contraction, meaning "using oxygen." Yes, but again, how does this all relate to your muscles getting tired? Muscle Fatigue occurs when the muscle experiences a reduction in its ability to produce force and accomplish the desired movement. The factors that explain fatigue are complex and after more than 100 years of investigation are still a topic of active research. For example, short term fatigue (failure to lift a heavy weight, do more push-ups, etc.) is different than long term fatigue such as as a marathon run, a 100 mile bicycle ride, or a full-day hike through the Rocky Mountains of Colorado. We do understand though some of the basic reasons that muscles become fatigued during high intensity exercise, most notably that the demand for oxygen can be greater than the supply. The blood flow to the muscle can be reduced because of 1) muscles intensely contracting can reduce blood flow and thus oxygen availability, or 2) the muscle is simply working so intensely that there literally is not enough oxygen to meet demand (a sprint at top speed). If such O2 isn't available as an electron acceptor , the Krebs cycle and electron transport chain cannot operate, and the muscle must gain ATP from other sources. For example, for rapid, intense activity, phosphocreatine (synthesized from amino acids) can serve as a phosphate donor to allow ATP formation. This is called anaerobic contraction, meaning "not using oxygen." 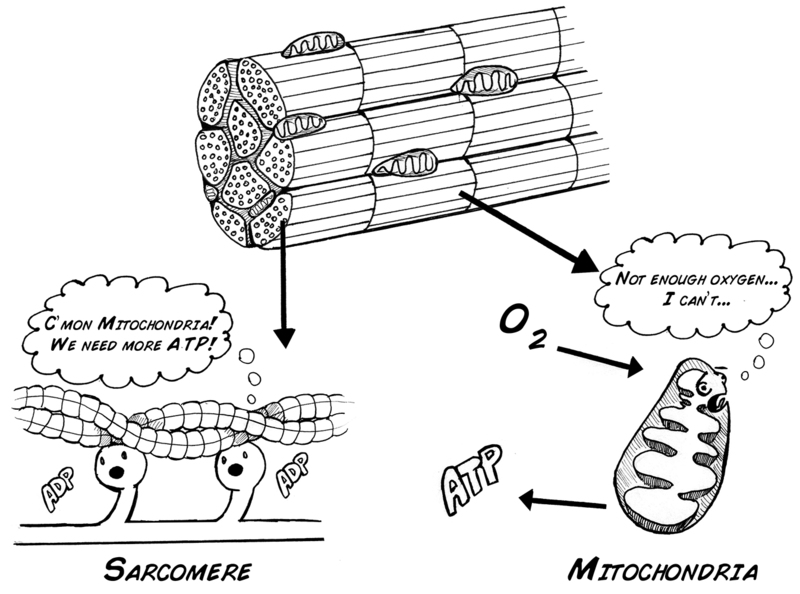 However, anaerobic contraction can lead to build-up of metabolites and waste products, and a significant increase in the acidity (decreased pH) inside the muscle cell, which can interfere with the many biochemical reactions necessary for the actin and myosin to produce force and slide against each other. This chemical change is thought to be the cause of the "stinging" or burning sensation you feel in your muscles as you become fatigued (such as in arm wrestling or in the last few reps of a difficult weight lifting set). We can observe the effects of these fatigue processes, albeit indirectly, by examining the amplitude of the EMG signal during a muscle contraction. 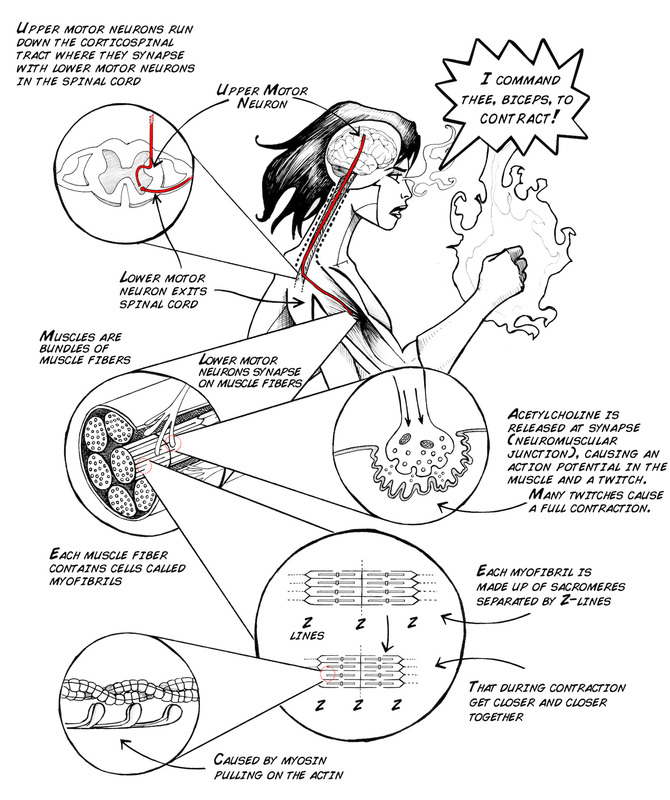 As fatigue progresses, 1) the firing rate of motor neurons drops, which in turn drops the number of action potentials the muscles themselves then fire, leading to a reduction in strength, and 2) muscles can often also continue generating action potentials due to neural drive, but the muscle is unable to contract due to molecular fatigue events in the muscle fibers, which in turn leads to a reduction in strength. Hook up your EMG patch electrodes to your bicep, plug the electrodes into your Muscle SpikerBox, and hook up your SpikerBox to either your mobile software or PC. Connect the EMG electrode patches to your inner forearm and hook up the cables and SpikerBox as previously noted. Use a hand-dynamometer or hand gripper (you should buy one in the 50-100 lb (25-45 kg) range), and squeeze the grip for as hard as you can for as long as you can. Record your EMG during this task and observe the amplitude and firing rate as before. Sometimes, when hiking in your favorite park (like the Wonderland Trail or Torres del Paine), you find, even if you are not very fit, you can hike for 6-10 hours. However, if you tried to lift a 100 pound (45 kg) barbells repeatedly, you would rapidly get tired within 5-30 reps over a couple minutes depending on your athletic ability. Why is the time scale of fatigue so different in these two activities? Try the biceps and forearms fatigue tests on both arms and hands to see if you observe anything different. As you know, you have a dominant arm/hand (left-handed vs right-handed). Is your dominant arm/hand stronger or more fatigue resistant than the other? How can two muscles that are about the same size be so different in their fatigue properties? We didn't cover it here, but you can begin reading about slow twitch and fast twitch muscle fibers to learn more. Are there muscles that are very fatigue resistant? Can you give us some examples? Work out your biceps for a month at your school gym. Measure your fatigue time and EMG changes before the period of training and after the period training using the same test load/force.